The annual Berlinale film festival in Berlin is always a star-studded event and the whole city is filled with a touch of Hollywood glamour as international film stars present new and upcoming films from which some are always nominated for Golden or Silver Bears. Paying tribute to classic films, the section “Berlinale Classic” presented the World Premiere of the third James Bond Film ‘GOLDFINGER’ in a newly restored and remastered 4K DCP (Digital Cinema Package – a collection of digital files used to store and convey Digital cinema (DC) audio, image, and data streams) version at the Haus der Festspiele on February 7th, 2015. 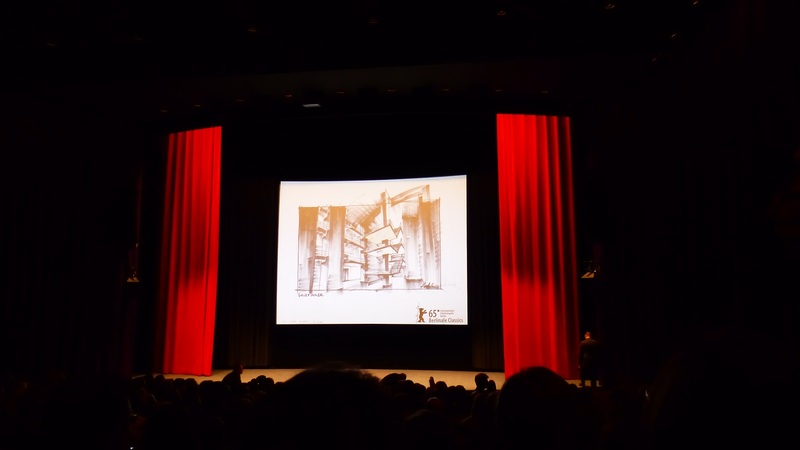 Academy Award winning Production Designer Ken Adam was the honorary guest of the evening and was introduced by Dr. Rainer Rother, artistic director of the Deutsche Kinemathek and head of the Berlinale’s Retrospective section. After almost one minute of applause, Dr. Rother explained that Sir Ken and his wife Letizia would stay for the screening and watch the film. 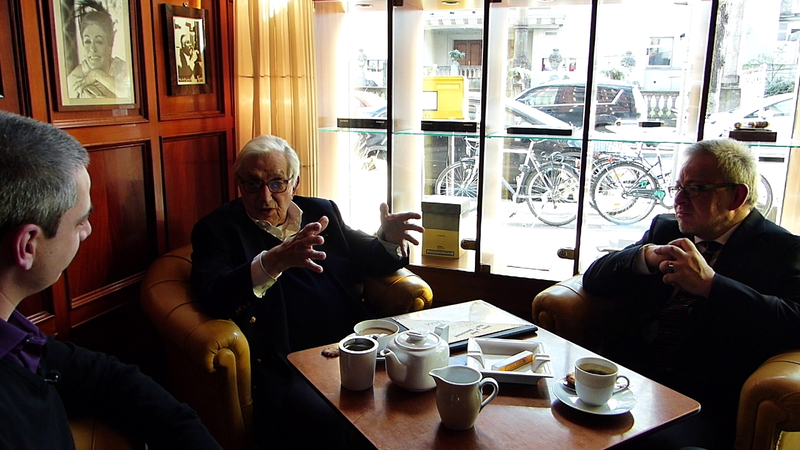 He then asked, if Sir Ken had had fun working on ‘GOLDFINGER’ to which he replied with a simple “Yes” with a wink. Sir Ken Adam then explained, that when the Fort Knox exterior was reproduced in Pinewood according to his drawings, the press could not believe it because of the size and detail of the construction. He also added, that the film had become interesting because of the amount of Gold used in it. After taking some photos for the press, the 1964 film, which has since become one of the most iconic ones of the whole franchise, started with the Gunbarrel and Bond Fans were delighted to see the film in crisp and sharp quality. During the screening, it was very interesting to notice the audience reactions to humour in the film, f.e. in the scene in which Bond throws a heater into the bathtub to kill a hitman and comments on it with “Shocking. Positively shocking.”. Throughout the film, the laughs came exactly at the right moments as it had been intended by the film producers. After the screening had finished, Bond Fans discussed, if the 4K resolution was an improvement of the 1964 classic. The immediate reactions were mixed but overall positive. Basically, the recent Blu-Ray conversion had already been a significant improvement to the older Bond films and absolutely sufficient in the eyes of a Bond fan. I personally thought, that the impact of the 4K version heavily depends on the distance between the viewer and the screen. The further away you are from the screen, the lesser you will notice the differences. However, I found that some facial expressions of the actors were more visible than before, especially in the final fight between Oddjob and Bond in Fort Knox. Upgrading technology at home with a 4K television would surely constitute an improvement because the size is smaller than in a cinema and the picture thereby sharper. Having a 4K version of a classic Bond film on a large cinema screen can be described more as a refinement than an actual improvement. 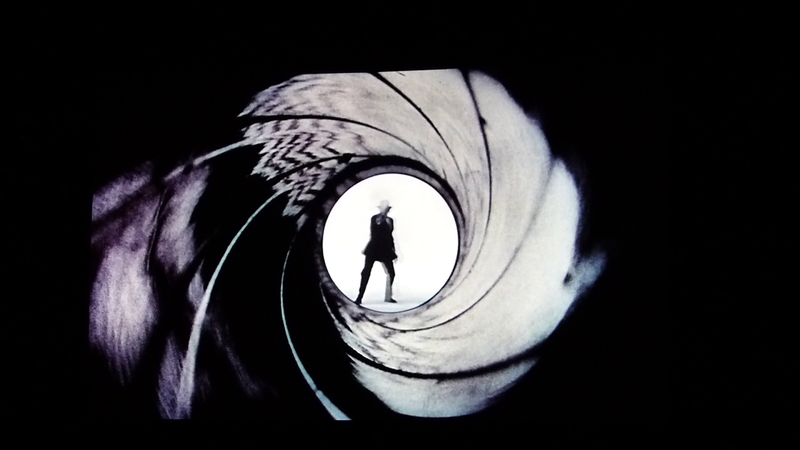 Still, it was a very enjoyable evening and of course an honor for the Bond Franchise to have one of the films re-screened in the way it was done at this years Berlinale. 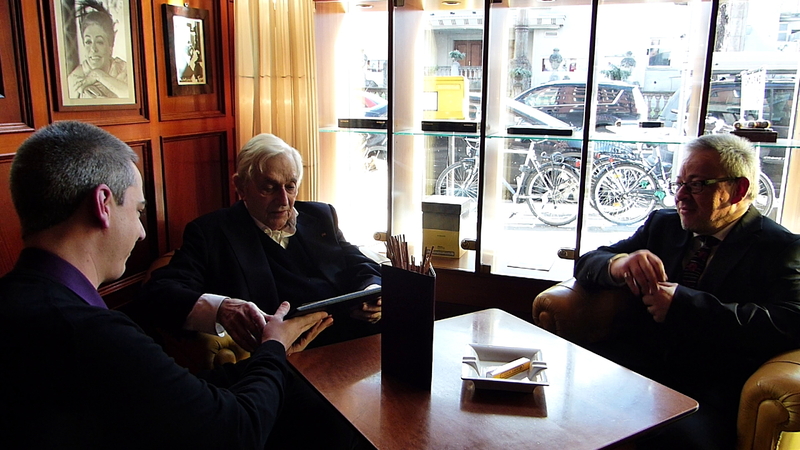 On Sunday morning, the Vice President of the German James Bond Club and me, in my role as an Adviser to the Club, had the wonderful opportunity to meet Sir Ken Adam at the Savoy Hotel and present him with the honorary membership in our club. He was very honored and took the time to sit down with us for a lovely and informative chat which took us on a journey through one of the greatest minds of Hollywood. It was interesting to explore, how the past and the present were connected with Sir Kens work on the James Bond videogames “GOLDENEYE: Rogue Agent” as well as “007 Legends” for which he contributed artwork. I mentioned, that I was often overrun and killed by swarms of enemies in these games for standing around idle and just admiring the level design. 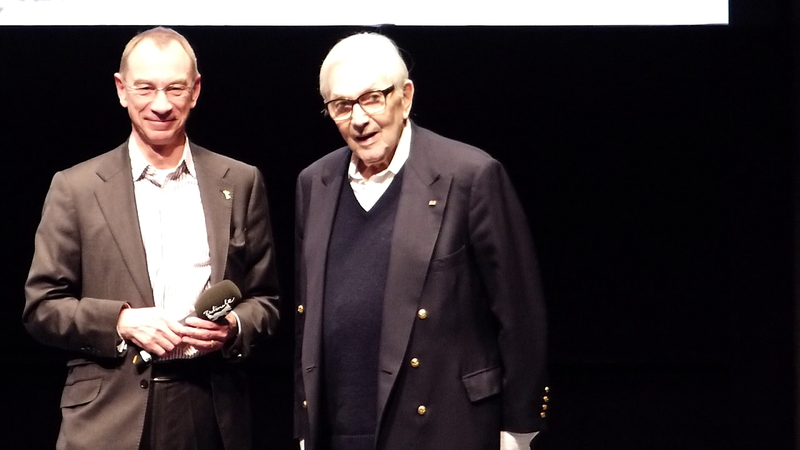 It was a complete joy to listen to Sir Kens amazing recollections of his time with the Bond films and to witness his incredible enthusiasm and passion when talking about his life´s work. From our side, we assured Sir Ken, that we see it as our duty to bear him and his work in remembrance for future generations of Bond and film fans. 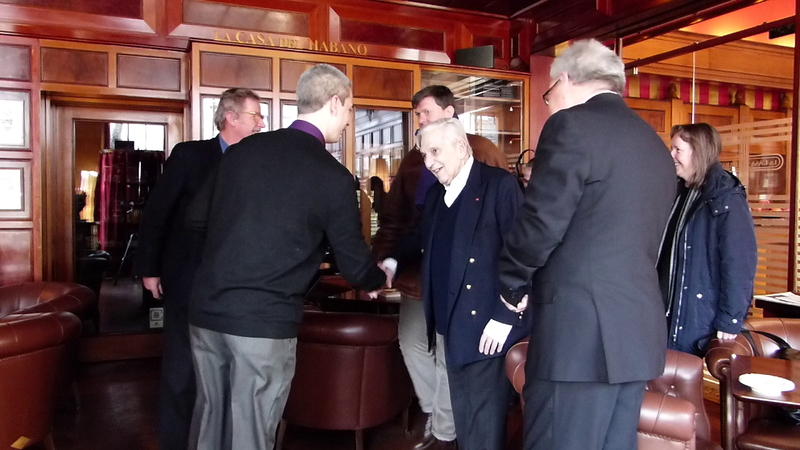 As our meeting drew to a close, Sir Ken added, that he had rarely met such sophisticated fans and felt very honored to have received the honorary membership in the German James Bond Club. Everyone who is interested to learn more about Ken Adams production design work should really pay a visit to the wonderful exhibition “Bigger Than Life. Ken Adams Film Design” at the Deutsche Kinemathek in Berlin which is still on display until May 17, 2015.